The Life of Brad: Got friends, Got Job, Got Bike? A couple of Calgary buds that I met on the way down to OZ stopped in last week and we went out for a couple of beers. Jeremy and Kris, Both engineers from U of C, Kris I briefly knew then and he is also the son on our recently departed Dave Ritchie from Colt. Both bike riders too! As for the job, I got a couple of shifts in a bar called "The Reef" as a "glassy (bar porter)", we will see how that goes. 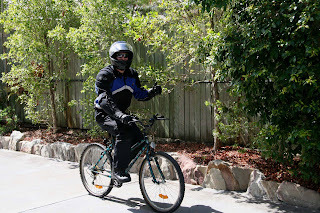 Finally I have a bike now and some may say it's a bit girly, but it gets me around (see photo). Well, it does look girly... did it come with the little training wheels? Ha ha.